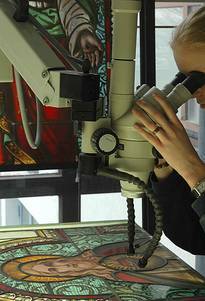 The stereo microscope is a standard tool in conservation. Gauges such as infrared thermometers, air-current gauges to record air speed, lux-meters, humidity gauges, laser distance gauges etc. Alarm installation with exterior-shell and interior monitoring along with alarm forwarding to a central office etc. are part of the standard equipment in our studio. Here, you can readmore on the conservation measures. With our analogue mid-format camera, one can create images with the equivalent of approx. 56 mn pixels. Our professional studio flash installation warrants top-quality images with consistent quality.